Getting an integrated view of up-to-date decision-making information … many key demographic-economic measures are developed by different agencies and organizations. It can be challenging to assemble these data for a holistic, more comprehensive view. Differently sourced data are developed for varying time periods and frequency of update; it can be problematic in bringing together monthly, quarterly and annual data — and have the most up-to-date view possible. This section is focused on the “APIGateway Integrated Data Profile” (IDP). The IDP is a report providing monthly, quarterly, annual and decennial data by county — any county in the U.S. See the current Mecklenburg, NC IDP. See more general information. Freshly updated IDPs can be generated for counties of interest using the no-fee, no-cost APIGateway. Follow these simple steps (How to Run Reports) to install the application on your Windows computer; create profiles of interest. Using API (Application Programming Interface) technologies, the APIGateway fetches data from multi-sourced servers where updated data are stored. There are no large database downloads; no custom application development steps. The IDP reports are generated in HTML structure and can be easily viewed with a Web browser. The data, and thus the reports, update monthly. Optionally update an IDP in March/monthly, getting new/updated workforce data … establishments, employment, wages by industry sectors and employment/unemployment. An interesting feature of the report is that it shows the annual demographic-economic data for Census 2000 and Census 2010 as well as the annual American Community Survey data and Census Bureau annual model-based estimates in a side-by-side manner. This longitudinal data view using multiple data sources creates an easy-to-consume, powerful and unique way to gauge patterns and trends. Monthly workforce data provide a valuable, more recent, update. The IDP structure is new and continues to evolve. Please send feedback and suggestions that might improve usefulness. 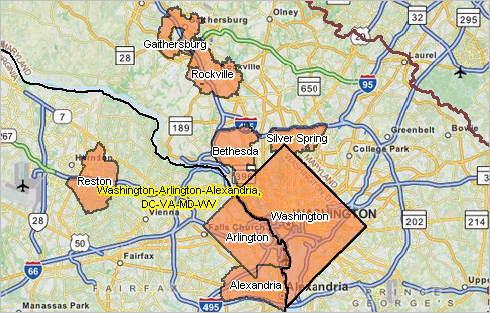 How does educational attainment vary by congressional district? or by city/place, school district or a range of other geographies? Educational attainment is one of several social characteristics measures. This section reviews the scope of social characteristics measures and how you can access and use these data for different types of geographies. About the data. 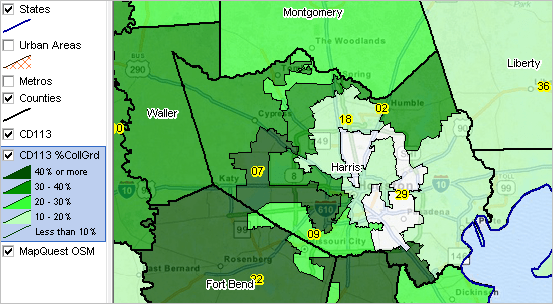 The map presented below shows percent college graduates by congressional district (yellow labels) in the vicinity of Houston, Texas (counties bold black; county names shown as labels). The thematic pattern shows item S067 shown in the DP2 interactive table and further discussed below. Click graphic for larger view and details. A selection of primary social characteristics measures available for wide ranging geographies is shown in the following scroll section. In the scroll section, subject matter items are organized into to mini-tables with related items. The number at the left of the subject matter item is also used as the short name for the subject matter item in the column header in the interactive tables and further described below. The U.S. national scope interactive tables provide access to approximately 150 items, updated annually, for a range of geographic levels. Most of these tables include the the primary geography as well as related geography. Use the interactive tables to view, query, rank, compare social characteristics of the population for these areas. The interactive tables listed above are structured and operate similarly. Items listed in the subject matter scroll box shown above are available for each area via the interactive table. An example. This short tutorial illustrates use of the interactive tables to examine educational attainment patterns for the Atlanta, Georgia. See a summary of key usage notes below this example. • Each row is a summary for the U.S. or a state, metro or county. • Educational attainment as measured by %high school graduates is item S066. • Educational attainment as measured by %college graduates is item S067. • Scroll right to view columns S066 and S067. • Dbl-click S067 column header cell to rank in descending order. • Click ShowAll button below table to reset start-up view. • Click the FindCBSA button below the table. – only rows for the Atlanta metro and Atlanta metro counties appears. • Click the ColSet1 button below the table. – only selected columns appear (and include S066 and S067). – you are able to examine the educational attainment for each area. • Click the column header cell for column S067. – the rows sort ascending on %college graduates. – you are able to see how educational attainment ranks by area. • Click the column header cell for column S067 again to sort in other directions. • Click ShowAll button and repeat process for a different metro. • All items are estimates centric to mid-2010 or 2012 depending on the table. • Click ShowAll button between Find/Queries. • Use mouseover on column header to view column description. • See ranking table below ranking table. See related ranking tables — http://proximityone.com/rankingtables.htm. • Cells with -1 value could not be estimated. The American Community Survey (ACS) estimates and ProximityOne projections provide “richer” demographic-economic characteristics for national scope geography. Census 2010 provides data similar to those items in the General Demographics section. Only the ACS 2011 estimates, ACS 2012 estimates and ProximityOne projections provide details on topics such as income and poverty, labor force and employment, housing value and costs, educational participation and attainment, language spoken at home, among many related items. The approximate 600 items accessible via the dataset are supplemented by a wide range of additional subject matter. integrate your own data; use GIS tools to create your own map views. Principal cities of metros are the main core cities in each metropolitan area. The largest city in each metropolitan or micropolitan statistical area is designated a “principal city.” Additional cities qualify if specified requirements are met concerning population size and employment. The title of each metropolitan or micropolitan statistical area (Core-Based Statistical Areas — CBSAs) consists of the names of up to three of its principal cities and the name of each state into which the metropolitan or micropolitan statistical area extends. See details. Based on the latest 2013 vintage CBSA definitions, there are 1,233 principal cities in the U.S. Designation as a principal city is not an indicator of size although all larger cities are principal cities. Principal cities range in population from Logan city, WV (2,015) to New York city, NY (8,199,221) (ACS 2012 5-year estimates). The total population of the 1,233 principal cities was 108,883,864 (35.2% of total 309,138,711 U.S. population). Use interactive ranking tables in the above sections to view, query, rank, compare characteristics of principal cities and/or all U.S. cities. To view characteristics of principal cities, click the “PrincipalCities” button below the interactive table. Join the ProximityOne User Group to use this GIS project; add your own data; change colors, labeling, subject matter (join now, no fee). An example of examining educational attainment for principal cities in a selected metro (Houston, TX) follows. – 26420 is the Houston CBSA code, find others as described below the table. – the table refreshes showing the 5 Houston principal cities. • Use the horizontal scroll bar to navigate the columns to the right so that column header S067 appears. The view appears as shown below. • Dbl-click the header cell S067 to rank descending on this item. The table now appears as shown below. Insights … educational attainment, percent bachelor’s degree or higher varies widely among these cities. 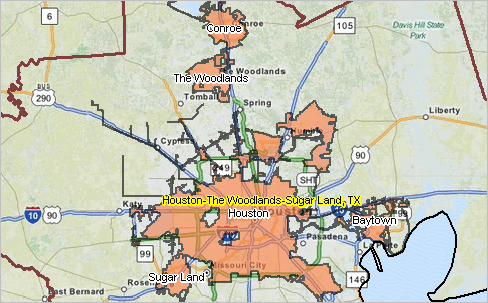 The Woodlands at 59.3% to Baytown at 14.3%; see Houston metro principal cities map above. Click ShowAll button and try a metro of interest. The largest city in each metropolitan or micropolitan statistical area is designated a “principal city.” Additional cities qualify if specified requirements are met concerning population size and employment. The title of each metropolitan or micropolitan statistical area consists of the names of up to three of its principal cities and the name of each state into which the metropolitan or micropolitan statistical area extends. 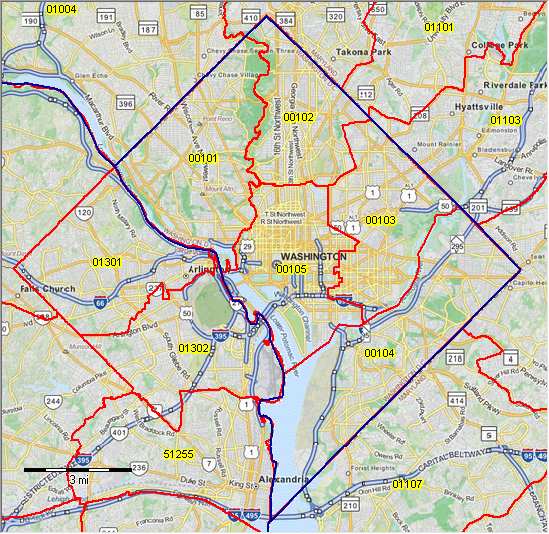 The U.S. Office of Management and Budget (OMB) delineates metropolitan and micropolitan statistical areas according to standards applied to Census Bureau data. A metropolitan or micropolitan statistical area has a core area containing a substantial population nucleus, together with adjacent areas having a high degree of economic and social integration with that core. 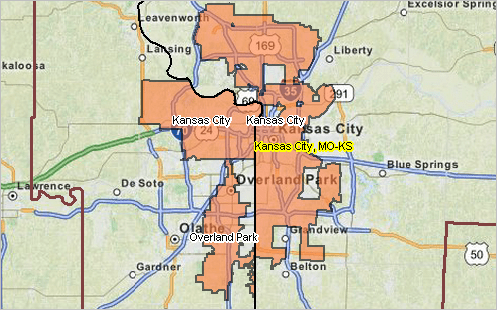 Current vintage metropolitan and micropolitan statistical area designations were announced effective February 2013. The term “core based statistical area” (CBSA) refers collectively to metropolitan and micropolitan statistical areas. Each CBSA must contain at least one urban area of 10,000 or more population. Each metropolitan statistical area must have at least one urbanized area of 50,000 or more inhabitants. 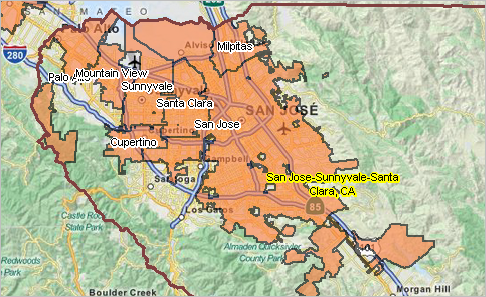 Each micropolitan statistical area must have at least one urban cluster of at least 10,000 but less than 50,000 population. See the web page http://proximityone.com/principalcities.htm for additional information about principal cities. 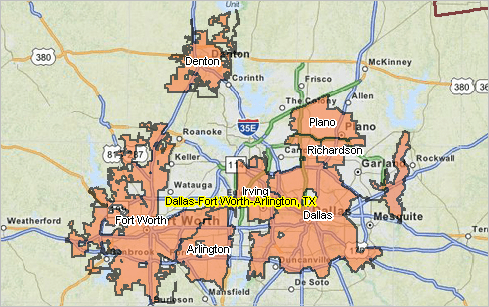 How does the demographic-economic make-up of the Dallas metro compare to the Houston metro … or any other set of metros? How do business opportunities and competitive position compare? Usually there are multiple answers to this question. 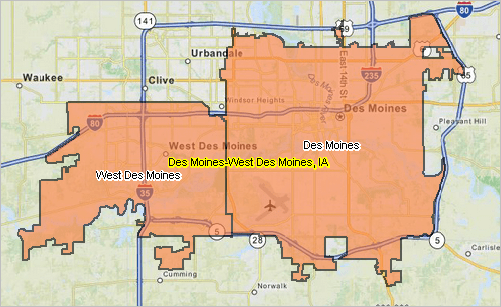 And typically, the best insights require examining drill-down geography at the metro component county level. The ability to interactively compare and contrast demographic economic characteristics of metropolitan areas and their component counties is uniquely available through resources described in this section. Metropolitan areas, “Core-Based Statistical Areas” (CBSAs) are defined by the U.S. Office of Management and Budget. CBSAs are comprised of one or more contiguous counties. This view below shows median household income by county and metro for Georgia and adjacent states. A query is placed on the CBSA layer to show only MSAs. The thematic pattern shows item E062 shown in the DP3 interactive table. Click graphic for larger view and details. Patterns shown for metros (cross-hatched pattern) and counties (solid pattern) in same view. View related Atlanta metro zoom-in (counties labeled with median household income). Use the interactive ranking tables to view, query, rank, compare general demographics, social characteristics, economic characteristics, housing characteristics for the U.S., each state, metro and county. These data are based on the American Community Survey (ACS) 2012 5-year estimates. Metros are defined as the latest 2013 vintage. See similar tables for: Census Tracts | Cities | ZIP Codes |School Districts. Use the web-based interactive tables to view metro component counties as illustrated in the following graphic. This graphic shows the Atlanta, GA metro and component counties. The table has been sorted on total population (D001) by clicking the column header cell. These data provide “richer” demographic-economic characteristics for national scope states, metros and counties. While Census 2010 provides data similar to those items in the General Demographics section, only ACS 2010, 2011, 2012 sourced data provide details on topics such as income and poverty, labor force and employment, housing value and costs, educational participation and attainment, language spoken at home, among many related items. The approximate 600 items accessible via the dataset/interactive tables are supplemented by a wide range of additional subject matter. ACS 2013 for all state, metros and counties become available in December 2014. As of 2012, the total U.S. Hispanic origin population was estimated to be 60 million based on ACS2012. The U.S. Hispanic population is a mosaic of many different specific origins (e.g., Costa Rica, Nicaragua, Panama, among many others reviewed below). This post is focused on resources to analyze the distribution of the Hispanic population by specific origin. These data, and insights from their analysis, can help groups, associations and other stakeholders better understand the distribution and characteristics of specific origin Hispanic populations to provide support and care services. The data can assist government agencies better communicate with specific Hispanic origin groups by understanding the distribution by specific origin and identify special needs by geography. They can help businesses better supply the types of products and services that might be needed and in demand for people of specific origins by geographic area. Use the interactive table in this section to view, rank, compare the distribution of the Hispanic population by specific origin for the U.S. by state and county. Use the U.S. by census tract shapefile with integrated Hispanic population by specific origin data to view pattern maps and geospatially analyze the specific origin populations with GIS tools. Scroll section — click graphic for larger view and details. Map views developed using CV XE GIS with custom developed GIS projects. Use this interactive table to view, rank compare the Hispanic population by specific origin by state county county. The following graphic illustrates use of the table to view the Puerto Rico Hispanic origin population for Florida ranked in descending order. Create similar views for other states and other specific origins. This section has focused on only the total population by specific origin. Extended insights are available from custom estimates using the 2012 ACS Public Use Microdata Sample (PUMS2012). Custom tabulations for Public Use Microdata Areas (PUMAs) can provide characteristics of specific origin groups including age, employment, income, housing, among many other richer demographics. There is no one best method of examining/analyzing different geographic areas based on demographic-economic characteristics. In this section three methods are compared, each having its own strengths and weaknesses. These methods are among yet others that can be reviewed in future posts. In this post, these methods are compared in context of examining characteristics of school districts. But we use these same methods to examine cities, counties, census tracts, ZIP codes, legislative districts … among many other geographies. Applications reviewed here are for the Atlanta, GA school district and Fulton County, GA school district. Maps provide the relative geographic view — the lay of the land — typically not available via tabular display of data. The following view shows the district boundary (bold blue boundary). Click graphic for larger and more detailed view. Fulton County school district is the two separate sections shown as orange crosshatch pattern; Atlanta school district is shown as blue crosshatch pattern. Fulton County, defined as the county subdivision of Georgia, covers the same ground as the combination of Atlanta and Fulton County school districts. These geographic relationships cannot be effectively understood without maps. Views developed using ProximityOne CV XE GIS software. One example — click the Economic Characteristics link. The side by side profile appears. On the new page, the CAP view, scroll down to “INCOME & BENEFITS ” and items E051. Here the distribution of households by household income can be viewed; easily comparing patterns between the areas. Easily select and compare among multiple measures. It can be seen that the Atlanta school district median household income (MHI) is $46,146 compared to Fulton County school district MHI of $68,238 — but at the same time the dollar and percent distribution of households by income can be effectively compared. Examine other side-by-side CAPs of interest. These insights cannot be gained from the maps alone. 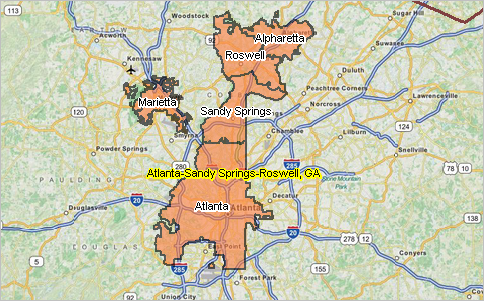 Yet the side-by-side CAPs still are not able to show how these districts relate to other Georgia districts (or other geography such as counties). Consider the role of the spreadsheet interactive tables. View other school district comparative analysis profiles. Spreadsheets reviewed here are in context of Web-based spreadsheets/interactive tables. The interactive tables enable query, ranking and comparison of these same subject matter across all school districts in Georgia. Use the Web-based interactive tables to view, rank, compare data shown in the above profiles for other districts. Here it can be seen that Fulton has the 6th highest $MHI among all Georgia school districts. Scroll down in the table to see that the Atlanta $MHI is 47th among the Georgia 188 school district areas. Click the ShowAll button to reset or view the start-up view. See additional usage details on the interactive table page. Each of these comparative analysis methods has its own advantages and limitations. Ideally they are used in combination. Each of the methods can also be extended. For example, the maps can be structured to show thematic patterns of subject matter in addition to reference maps only. Or show related geographies not depicted in the basic reference map. The “weakest link” in effective comparative analysis may be the selection/availability of the subject matter. Are these the right (scope of subject matter) data to examine the issues of interest? … most current data? … trend data required? … accuracy of the data? .. what are the alternatives — and the cost of alternative data? The American Community Survey (ACS) 2012 “3-year” Public Use Microdata Sample (PUMS) data were released by the Census Bureau this week. This release follows the release of the ACS 2012 “1-year” PUMS in 2013. The PUMS data enable development of custom demographic estimates for each of more than 2,000 Public Use Microdata Areas (PUMAs) covering the U.S. wall-to-wall. The estimates are not developed by the Census Bureau but by data users according to their specifications. The availability of these custom estimates greatly augments the scope of decision-making information for wide-ranging demographic-economic topics. PUMAs shown with red boundary. Click graphic for larger view and details. The 1-year PUMS files cover a one-year period, such as 2012, and contain records of data from approximately 1% of the U.S. population and can be used to develop estimates for that year. 3-year PUMS files cover a three-year period, such as 2010-2012, contain records of data from approximately 3% of the U.S. population and can be used to develop estimates centric to 2011. 5-year PUMS files covering a five-year period, such as 2008-2012, contain records of data from approximately 5% of the U.S. population and can be used to develop estimates centric to 2010. PUMS files contain a sample of respondent level data from a decennial census or American Community Survey (and yet other surveys). Each record in the person file represents a single person; each record in the housing unit file represents a single housing unit. In the person-level file, individuals are organized into households, making possible the study of people within the contexts of their families and other household members. Each person or housing unit record contains fields/variables for nearly every question in the census/survey, as well as many new items derived responses (such as poverty status). PUMS files provide a way to develop custom estimates of demographic summary statistics for Public Use Microdata Areas (PUMAs), states and the U.S. The ACS PUMS files are comprised of samples of individual respondent person and housing unit records. The ACS PUMS files are released annually providing a means to develop similar custom estimates with annual updates. For example, public and private school enrollment by grade for specific universes (e.g. by other attributes of person such as language spoken, poverty status etc.) not available elsewhere. School enrollment is one among many demographic items that can be estimated. Thousands of subject matter combinations are possible. Public Use Microdata Areas (PUMAs) are geographic areas. How can they be powerful? The 2,378 2010 vintage PUMAs are developed using Census 2010 geography, cover the U.S. wall-to-wall, conform to state boundaries, and where possible are comprised of whole Census 2010 census tracts. The first use of the 2010 vintage PUMAs is with the ACS 2012 PUMS and 1-year summary statistic data. While PUMS files contain data for respondents across the U.S., most lower level geography are not identified by any variables in the PUMS files. The PUMA is the most detailed unit of geography identified in the PUMS files. PUMAs are special non-overlapping areas that partition each state into contiguous geographic units containing no fewer than 100,000 people each. 2010 PUMAs were built on census tracts, and cover the entirety of the United States and Puerto Rico. The power of the PUMA geography is this (for example): Los Angeles County, CA is subdivided into 69 PUMAs. Using the ACS PUMS microdata custom summary statistic estimates can be developed by PUMS users for each of these PUMAs. This enables availability of reasonably current (2012) subcounty estimates which meet the user’s specific subject matter needs (within the limits of the ACS questionnaire topic coverage). Since all Census Bureau questionnaire survey responses are confidential, many variables in the PUMS file have been modified to protect the confidentiality of survey respondents. For instance, particularly high incomes are “top-coded”, uncommon birthplace or ancestry responses are grouped into broader categories, and the PUMS file provides a very limited set of geographic variables.